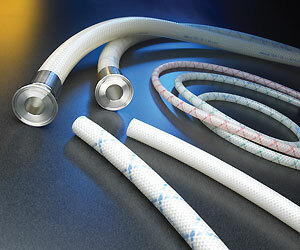 Sani-Tech® STHT®-R platinum-cured braid-reinforced silicone hose is an ultra-flexible, high-purity hose that was developed for higher pressure applications. STHT®-R is manufactured with Sani-Tech® 65 brand silicone resin. Sani-Tech® STHT®-R platinum-cured silicone hose resists temperature extremes, ozone, corona, radiation, moisture, compression sets,weathering and chemical attack and imparts no taste or odors to fluids transported within it. Sani-Tech® STHT®-R hose withstands repeated autoclaving and resists the adherence of blood products and other sanitary fluids. Sani-Tech® and STHT® are registered trademarks of Saint-Gobain Performance Plastics.